Allavino combines style, versatility, and cutting edge features to make this FlexCount Series 3Z-VSWR5656-BWT Three-Zone Wine Cooler Refrigerator just as unique as your wine collection. 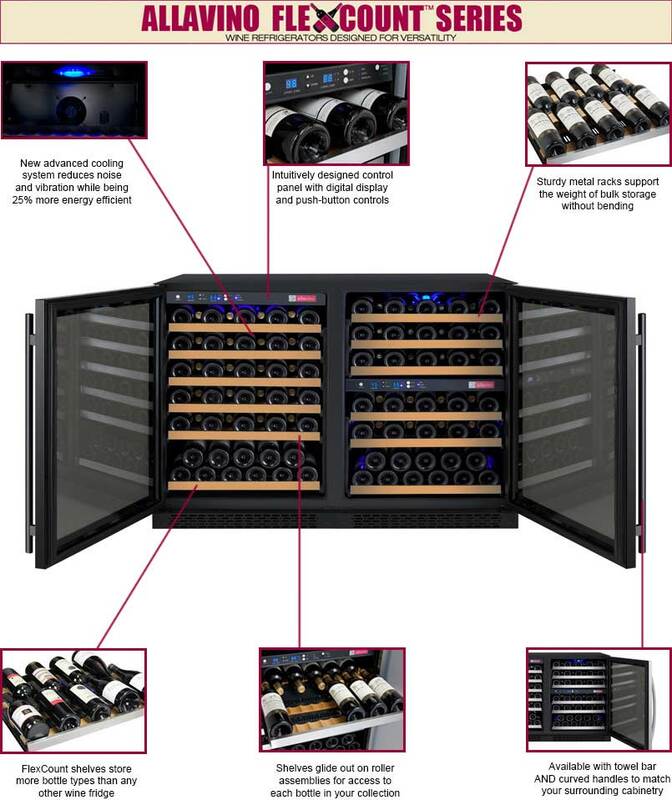 This wine refrigerator is made up of one single-zone 56 bottle unit and one dual-zone 56 bottle unit with opposite hinged doors, and can store up to 112 bottles on its specially designed FlexCount shelves. These durable metal shelves are strong enough to provide reliable stability and prevent sagging over time, yet thin enough to allow more space between shelves that you will find in similarly sized wine coolers, making it possible to store larger bottles without sacrificing bottle count. Each shelf features beautiful wooden fronts and wood slats that gently cradle your bottles to help minimize harmful vibration. The 3Z-VSWR5656-BWT's three zones can each be individually monitored using two digital LED displays with push-button controls, and the displays include "red", "white", and "sparkling" indicator lights that allow you to confirm at a glance that your collection is being stored at its ideal temperature. A front-venting design and finished top and sides allow this wine cooler to be used built-in or freestanding. With 10 shelves that can hold up to 9 bottles each and two bottom shelves that can hold up to 11 bottles each, the 3Z-VSWR5656-BWT can store up to 112 bottles total. Each zone's temperature can be quickly and easily set and monitored using clear digital displays with intuitive push-button controls. These controls can also be used to turn the cool blue LED lighting on or off. Allavino's revolutionary FlexCount Series shelving features a durable metal construction that is thin enough to maximize available storage space yet strong enough to resist sagging. These shelves have beautiful wooden fronts and wooden slats that gently cradle your bottles to prevent harmful vibration from affecting your wine. FlexCount shelves glide out smoothly on ball-bearing tracks to give you convenient access to any bottle in your collection. These doors feature built-in security locks that help protect your collection from unwanted access. Two extra keys are included to allow you to always have a backup on hand. This unit has a finished top and sides that make it suitable for freestanding use, as well as a front-venting design that lets you build it into your cabinetry for a seamless look that does not require extra space on the sides for air circulation. It comes with both towel bar and curved handles to match the surrounding decor.